Categories: Clearance Items, Other Conventionals. A lightweight multi-purpose elliptical reflector floodlight. The 155 scoop produces a very diffuse, soft-edged beam of 20 feet in diameter at a distance of 7.5 feet. The 155 is designed to operate both standard incandescent and high color temperature tungsten halogen lamps. 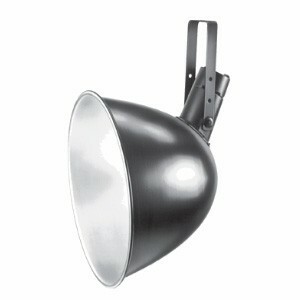 The luminare is used in theater and television as both a flood light and a cyc fixture. Other uses include photographic and television remote fill light. The scoop is an ideal fixture for color blending and for creating smooth even washes of light.